The total conquest of space in exact perspective represents the landmark of a new era in the drawing world. With the discovery of the square on a shortening (scorcio) scale in any type of perspective, the depth is no longer a taboo; hence, one can work the three-dimensional space in millimeters. Try to do the following test:- Bring your hand close to your eyes and then slowly move it away until ensuring perfect visual sharpness. You will notice that you need a 17-cm space to have a sharp vision. Therefore, I considered two overlapped images to draw in perspective: one out-of-focus image very close to the eyes and another sharp and well focused image 17cm farther. According to Pythagoras, the symmetry of the flat space is a square. Therefore, in my opinion, the horizontal flat surface, the visual field, is simply the result of two overlapped squares 17cm apart from each other. 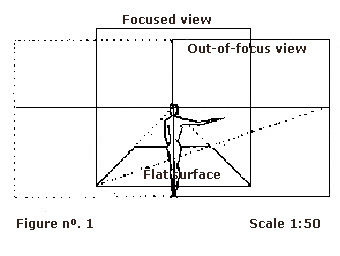 When we focus an image at the closest point, our vision does not reach beyond 2.60m or 2.70m. I considered a 3-m square to facilitate the construction of the drawings. Remark: The out-of-focus vision is at the right and left side of the viewer.